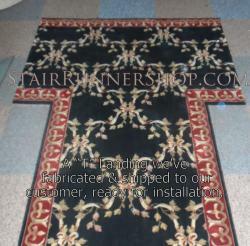 Following are categories of custom services for your stair carpet project which we offer shipped ready to install. 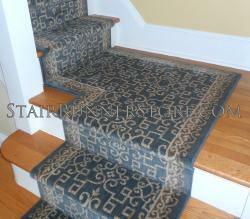 Under each service are several photo exampes of actual stair runner installation and custom stair landing fabrication we've completed. These custom landings can be fabricated and shipped for your local contractor to install. 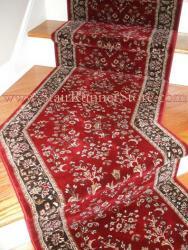 Most runner products can be fabricated as seen in the stair runner installation photos under each category. 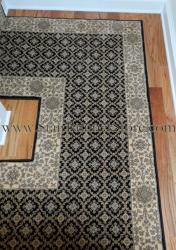 Please Contact Us with questions or to discuss your roll runner choice, pricing, and the details of your stair runner or hall runner project. To provide these services we will need your stair counts and landing dimensions, and in some cases may need a paper template to ensure the proper size or shape for your custom stair runner project. 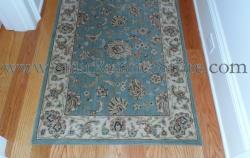 You can submit the information needed by using our Custom Landing Quote form found on each stair runner product page.